A child plays a toy guitar during a rally ahead of a general election in Bangkok, March 22, 2019. The nation's first general election since the military seized power in a 2014 coup is scheduled to be held March 24. Thai voters head to the polls Sunday for the first time in nearly five years, and analysts say the results could have an impact on democracy throughout Southeast Asia. Thailand's military junta took power in May 2014, when then-army chief Prayut Chan-ocha led a coup that toppled the government. Observers see the coming elections as a struggle between democracy and military rule. Prayut, now seeking the premiership, has said that if he wins, voters would be returning his junta-led country to a "democracy." Prayut Chan-ocha of the Palang Pracharat Party receives flowers from supporters during an election campaign rally in Bangkok, Thailand, March 22, 2019. 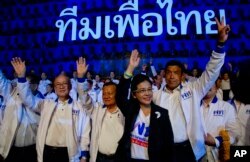 Thailand is a member of the Association of Southeast Asian Nations, and pro-democracy advocates within the trading bloc are paying close attention to the vote, despite its policy of noninterference in members' internal affairs. The ASEAN Post, an independent regional digital media company in Kuala Lumpur, recently noted that freedom of expression, peaceful assembly and press freedom had deteriorated since the junta seized power, initiating the longest period of army rule in modern Thai history. "Several hundred activists and dissidents have since been called national security threats and faced serious criminal charges such as sedition, computer-related crimes and lese majeste [insulting the monarchy] for peaceful expression of their views," it noted in a recent opinion piece. The coup — Thailand's 13th since 1932 — ousted then-Prime Minister Yingluck Shinawatra and caused international outrage. The pending elections, the military hopes, will fix that. The election framework echoes the 2015 ballot in neighboring Myanmar, where hopes of democratic freedom were dashed by a military that has maintained an overarching influence on a civilian administration, through its allotted seats in parliament. A more drastic story has unfolded along Thailand's eastern border. Cambodia was returned to a one-party state last year after the main opposition party was banned from competing at elections, media outlets were closed and political dissidents were jailed, raising the prospect of U.S.- and European-imposed sanctions. Elections will also be held in Indonesia in April, and midterm polls are to be held a month later in the Philippines, where the separation of powers — a cornerstone in any democracy — has foundered amid the government's war on drugs. Sudarat Keyuraphan, leader of the Pheu Thai Party and a candidate for prime minister, second right, and contestants wave during a rally ahead of general elections in Bangkok, Thailand, March 22, 2019. Singapore has been ruled by the same party since independence in 1965. Of the remaining non-democratic countries, communist Vietnam and Laos have initiated crackdowns on dissent, while Islamic Brunei has instituted sharia. David Welsh, country director in Southeast Asia for the Solidarity Center, a nonprofit that seeks to help build a global labor movement, said human rights were a major concern ahead of looming elections, and that the strong-arm from governments favoring big business were affecting workers and trade union issues. "The prospects for business and trade are probably pretty good. The prospects for labor laws and worker protection aren't, although I've been pleasantly surprised by what's happened in Malaysia, so let's see," Welsh said. Malaysia emerged as one the few democratic bright spots among the 10 members of ASEAN after the electorate, which tired of allegations of gross corruption, stunned pollsters and ousted Prime Minister Najib Razak, who is now facing trial. But observers say the chances of the Thai junta losing power at the ballot box appear remote. A supporter takes a selfie with the leader of Thailand's Democrat Party and candidate for prime minister, Abhisit Vejjajiva, center, during a campaign rally in Bangkok, Thailand, March 18, 2019. Under a new constitution, the next Thai prime minister will be elected at a joint sitting of parliament. The 250 members of the Senate will all be appointed by the military, with political parties contesting only the 500 seats in the House of Representatives on Sunday. That heavily favors Prayut, who led the coup and is hoping to legitimize his leadership by standing for prime minister. The Southeast Asian Press Alliance has expressed concerns about his leadership, citing a crackdown on press freedoms, while the Asian Network for Free Elections has warned of "inconsistencies and irregularities" in the lead-up to the election. Those inconsistencies were also noted by Laddawan Tantiyitayapitak, vice president of Poll Watch in Thailand. She said vote buying in the poorer provinces had emerged as an issue in campaigning, but that so far the Election Commission of Thailand had failed to act on complaints. "They start from 100 baht, 200 baht, 300 baht to 500 baht. Now it's 1,000 baht (about U.S. $32) that they are saying they are going to give to the people" for their votes, she said. Laddawan said voters were also being organized into large groups to be trucked to the polling booths, where they have been instructed to vote for the same political party en masse and were offered a free lunch. "The politicians, they do not realize that what they are doing is wrong," she said. "But nowadays, people, they realize, so vote buying may or may not affect the result of the election." Laddawan declined to name the political parties that she said were offering money in return for votes, but said there were "many." The U.S. is urging its citizens to abide by Thai laws that prohibit criticism of the monarchy, avoid any election-related large gatherings, and monitor international and Thai media before, during and after the elections.